An unexpected kindness reignites a passion for music, which offers an outlet for grief, as well as a new career path. A chance meeting turns into a mutually supportive, productive and enduring musical collaboration. We often forget how much of a role luck – fate, destiny, whatever we call it – plays in our lives. For Judi Jaeger, two occurrences stand out, with relation to her singing and songwriting. From Way Up Here is Jaeger’s first CD with Bob Reid; she has two prior solo recordings. 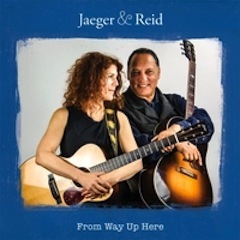 Released last summer, From Way Up Here features original music by both Jaeger and Reid, as well as covers of some of their favourite songs. But Jaeger was born in Ottawa. 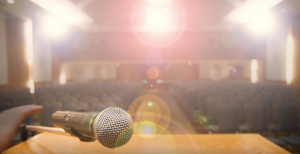 And she spent her teen years in Vancouver – “I went to Eric Hamber High School … where I sang in the swing chorus, played the flute in band class and was in some of the musicals” – as well as attending University of British Columbia. “I am still Canadian deep in my soul despite living in the States for many years,” she said. Jaeger learned to play guitar when she was 15 – her brother, who is five years older, taught her the basic chords. “I played and sang folk songs for myself, and for friends when I went to Young Judaea summer camps,” she said. “When I was 20, and very busy – I was in college (I went to UBC for a few years and Carleton in Ottawa) – I put it away and didn’t touch it for 25 years. “I picked it up again through some serendipity when a woman who was working for us as a nanny took my guitar, unbeknownst to me, to be restrung and presented it to me saying, ‘Here it is, now you can play it again,’ because I had been making noises about writing a song to deal with the lingering grief over my mother’s passing a few years before. One listen to this beautiful and moving song, which was released in 2007, and it’s obvious that Jaeger has natural talent. But she wanted more from herself. Jaeger played in a band for a few years and was in another duo for about five years. “Through my songwriting community, I learned about an acoustic music camp for adults called California Coast Music Camp,” she said. “It is a nirvana experience where about 100 adults attend a one- or two-week camp to study and play acoustic music. You can learn a new instrument or work on the one you play already. There are concerts and workshops and classes. It is collaborative, supportive and educational all at once. It was the best experience. I went about five times. Jaeger is the daughter of Max Roytenberg – an occasional contributing writer to the Jewish Independent, and the proud father who alerted the JI to Jaeger’s latest CD – and Lorraine Davidson, who died in White Rock, in December 2004, at the age of 71. “And she had been declining for at least 10 years,” shared Jaeger. “So the ‘loss’ began when she was very young. She had a degenerative brain disease like Alzheimer’s. “I felt cheated and thought she was cheated, too, and I felt angry that she didn’t get to enjoy her senior years or her children and grandchildren as she might have – my children were 3 and 6 when she passed away. I carried those feelings around for a couple years. One day, I just started thinking about this idea, that I would write a song about how I was feeling, even though I had never written a song before. I thought about this for a few months. I love music and always have, and I’ve always loved to sing. Then my guitar came back into my life with fresh strings (as I explained) and this gave me my outlet. Another powerful song on From Way Up Here is Jaeger’s “Love Caught Her,” written for the organization Community Overcoming Relationship Abuse (CORA). Jaeger was a lawyer, until she retired from the profession in 1997. “As a family law attorney,” she said, “I saw domestic violence in my practice. It was there. I began to support my local domestic violence prevention organization (CORA) and I became friends with the executive director. Many years later, when she learned about my songwriting, she asked if I would consider writing some songs for them, and coming to perform them at a fundraiser they were having. I agreed and I wrote two songs for them in 2011. One of them, ‘Love Caught Her,’ is on our Jaeger & Reid album; the other song has never been recorded. Jaeger and Reid play “house concerts and listening rooms in many different cities in the United States.” The pair came to Vancouver and Salt Spring Island last August, soon after their CD release, and they are hoping to get back to Canada this year. If it at all compares to their first recording, it is an album to eagerly anticipate. For more on Jaeger and Reid, visit jaegerreidmusic.com.